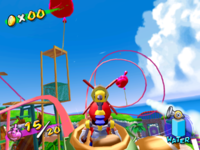 Roller Coaster Balloons is the eighth episode of Pinna Park in Super Mario Sunshine. The episode's objective is to pop all the Bowser Jr.-shaped balloons while riding the roller coaster. At the roller coaster boarding area, the player needs to talk to the green Noki, who will ask Mario if he wants to ride the roller coaster and try to pop all the balloons. The player needs to pop all twenty balloons before the roller coaster completes three laps around the track. Failure to do so before then will result in an instant loss of a life. The player will have thirty-three Water Rockets to fire and the player can pop multiple balloons with one rocket if they aim the rocket correctly. The balloons are grouped into pairs of either two or three and are placed in various areas around Pinna Park. If the player manages to pop all twenty balloons before the roller coaster completes three laps, they will be rewarded with a Shine Sprite. This page was last edited on May 24, 2018, at 21:19.